Jacinda Ardern says petrol retailers are fleecing us. But is that true? Bernard Hickey explains what's underneath the pricing and industry dynamics at the pumps. This week, Jacinda Ardern accused fuel companies of profiteering and promised to fast-track laws to allow a market study by the Commerce Commission. The fuel companies denied 'fleecing' their customers, but official figures show margins have doubled in the last decade. Z Energy's arrival in 2010 is a major factor. Are they fleecing their customers? It's rare for any politician to accuse companies of deliberately over-charging their customers, but that's what Jacinda Ardern did on Monday as the Government moved to blunt the political damage of fast-rising fuel prices. The Prime Minister took a leaf out of Shane Jones' book and accused fuel companies of padding their profits at the expense of their customers, although she stopped short of naming a specific company. She was explaining why fuel prices had risen 39 cents a litre over the last year, and pointed to a 9.8 cent a litre increase in fuel company profit margins. She said 6.8 cents of the rise came from taxes and 22 cents came from the rising wholesale price of fuel because of higher oil prices and a lower currency. "Consumers, in my book, are being fleeced," she said. Ardern referred to a doubling of fuel company margins between 2008 and 2017. "That represents a transfer of wealth from petrol consumers to producers to the tune of hundreds of millions of dollars a year," she said. Ardern then told the AM Show the fuel companies were profiteering. The chart above courtesy of interest.co.nz shows the increase in fuel industry profit margins, which started in 2010. That was when Infratil and the New Zealand Superannuation Fund bought Shell's service stations and embarked on an openly-declared plan to end a price war at that time with other firms. The renamed Z Energy said it wanted to increase profit margins to make the industry sustainable in terms of shareholder returns and reinvestment in infrastructure maintenance and safety. Price wars since the arrival of Gull and Challenge in the late 1990s drove returns to such low levels that Shell and other global oil firms considered pulling out of New Zealand. Since then, Z Energy has bought Caltex's network of service stations from Chevron to attain a 45 percent share of the market. The acquisition was waved through by the Commerce Commission despite the opposition of one commissioner on the grounds it would reduce competition. The industry argues that the rise in margins simply brings profits back to a longer term equilibrium and that comparing with the trough in 2008 is misleading. It argues it has reinvested some of the profits in improving the quality of stations and the safety and reliability of the infrastructure, including terminals, tanks and pipes. This chart below from MBIE's Fuel Market Financial Performance Study from last year shows how margins have risen and fallen over the last 30 years. MBIE found in that study that retail margins had risen 13 cents a litre between 2013 and 2017, and that it could not be explained by capital expenditure (ie it went straight into profits and dividends). 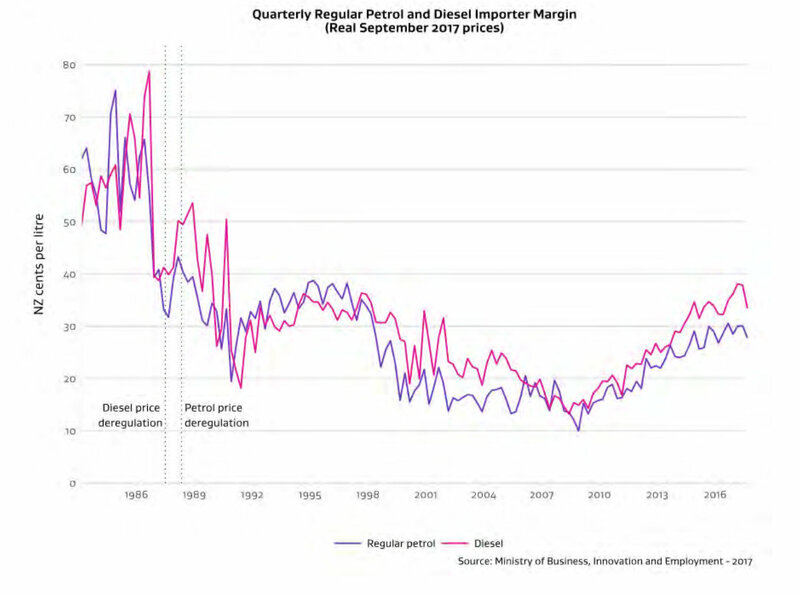 MBIE found that margins had risen for retail fuel for motorists, but not in other markets such as aviation, marine, bitumen and commercial. Z Energy CEO Mike Bennetts said Ardern's comments about margins were "inconsistent with Z's own experience." He said the MBIE data that her comments were based on was often volatile and subject to revision. He again welcomed the plan for a market study. Gull GM Dave Bodger, BP MD Debi Boffa and Mobil manager Andrew McNaught all said New Zealand had a "highly competitive petroleum market," as RNZ reported. What does the Gull effect look like? 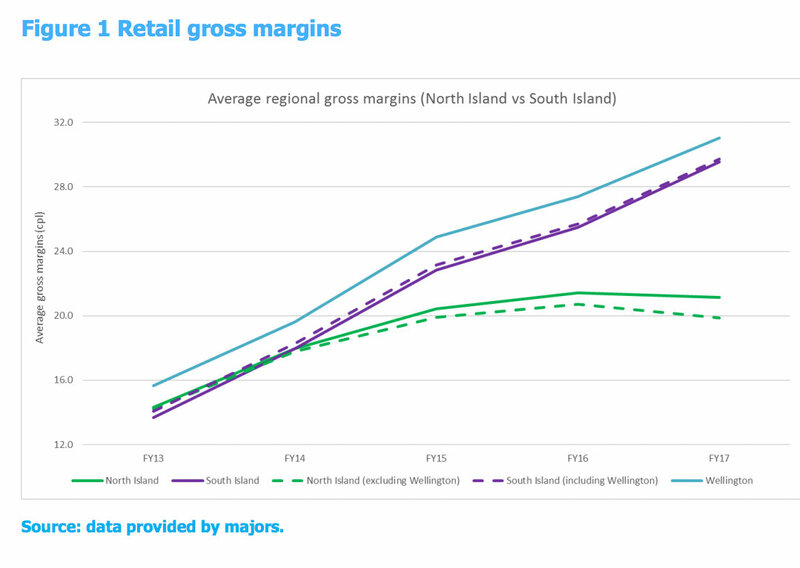 MBIE also found that margins had risen even faster in Wellington and the South Island, where Gull and other independent stations do not operate because they do not have access to fuel terminals, which are owned by the bigger players. Gull and others do have access to a terminal at Mt Maunganui for imported fuel, but don't have access at Wellington or Lyttelton. There has been some evidence that the big three, Z Energy, BP and Mobil, have been cross-subsidising areas that compete with Gull with lower prices at the expense of higher prices in Wellington and the South Island. The 11.5 cents per litre (including GST) fuel tax imposed on Aucklanders from July 1 may also have added to the pressure for cross subsidisation. The chart above from an NZIER/Grant Thornton/Cognitus study for the MBIE report shows the divergence between Gull and non-Gull areas over the last four years. 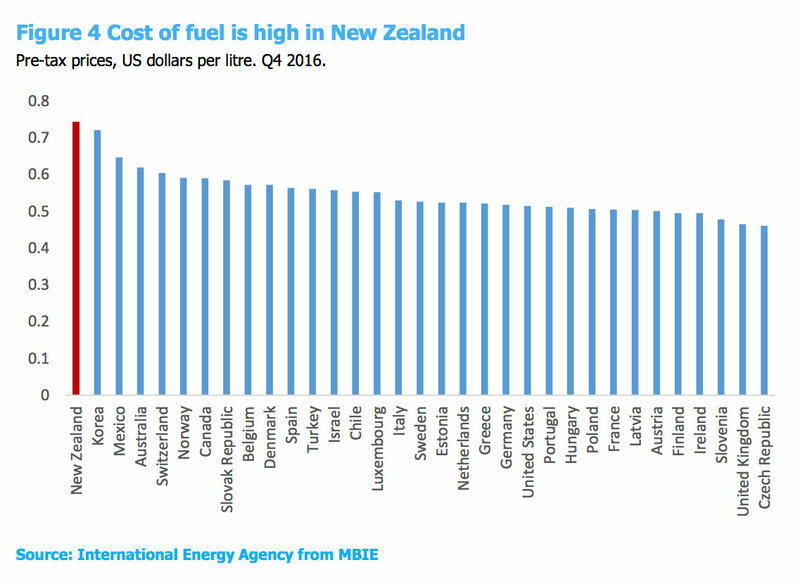 The end result of the change of Shell ownership and strategy, the takeover of Caltex and the Gull Effect has been a rise in margins so that New Zealand now has the highest pre-tax fuel costs in the OECD, as shown by this chart from the same NZIER study. So what is Labour doing about it? Jacinda Ardern said the Government would prioritise the Commerce Amendment Bill and hoped the legislation could be passed in the late-October sitting block of Parliament. The bill was introduced in March and passed its first reading in May. The select committee report is due back on November 2. The long-awaited amendments to the Commerce Act will allow the Commerce Commission or ministers to nominate a sector to be subject to a market study into anti-competitive behaviour. It brings the Commission's powers into line with similar bodies overseas such as Australia's ACCC. One of the problems MBIE had with its study last year was that Mobil and Gull did not provide full information, which meant MBIE said it could not conclude if the market was not competitive, even though there were reasons to suspect a problem. If passed in October, the Commerce Commission would then have to conduct a market study, which would not report back until early 2019. Ardern said she expected the fuel market would be the first for a study and that the Government would prioritise a response to it. 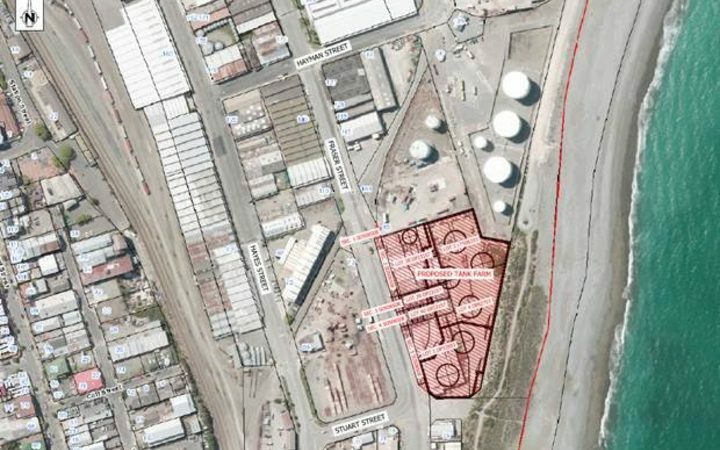 Potential regulatory options could include somehow creating some sort of wholesale market for fuel whereby independents such as Gull and Waitomo were allowed to buy access to fuel through the Wellington and Lyttelton terminals, although there is also a new $30 million independent terminal being built at Timaru (photo supplied below) over the next two years. Could National have done more? Several National ministers were also advised over the last three years of the expansion in fuel margins and at various points they tried to jawbone margins lower. 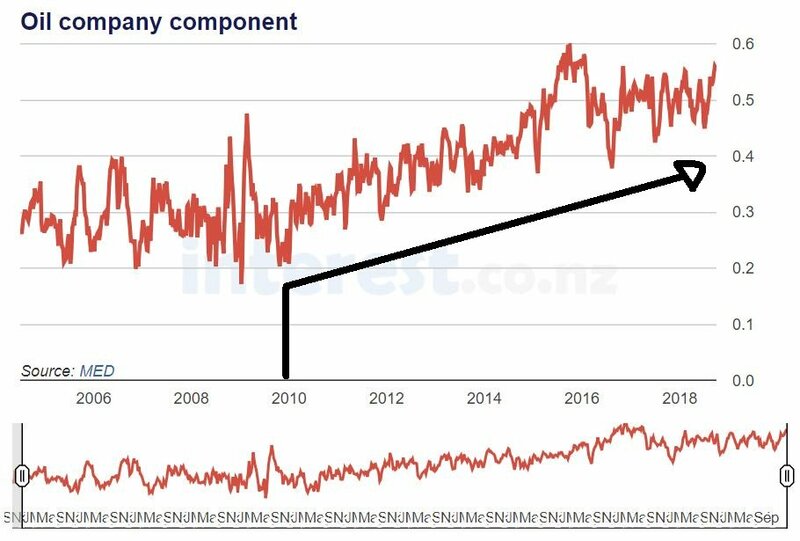 Then Energy Minister Simon Bridges warned oil companies about high margins in a letter in February 2015, which led to a temporary reduction. His successor, Judith Collins, then set up the MBIE inquiry in 2017 and also then recommended the market studies powers be used. However, they weren't in place and National had not made any progress. Then Commerce Minister Paul Goldsmith announced in November 2015 that the Government would consult on giving the Commerce Commission market powers. Nothing much happened after that from the Government's point of view. The Productivity Commission recommended the introduction of market studies in June 2014. The Government did nothing over the next three years to make that happen, apart from embark on consultation. Many of its largest corporate supporters opposed the introduction of market studies. Now-National Leader Simon Bridges is now calling on the Government to abandon its fuel excise increases of 10.5 cents a litre over the next three years. But he has also not ruled out keeping the levies in place if he were to win power in 2020. National introduced similar sized fuel levy increases during its time in power to help pay for Roads of National Significance. Labour is using its levy increases to help pay for rail and other public transport, along with road safety improvements. Why could higher prices actually be good? Meanwhile, there is the broader issue of whether Governments of both colours should actually be preparing voters for significant and structural increases in fuel prices to discourage fossil fuel use in any more urgent response to climate change. Yesterday, the IPCC released a major new report saying the world was on track to increase temperatures by 3.0 degrees from pre-industrial levels and that urgent action was required now to limit the increase to a less damaging 1.5 degrees. The report argues that limiting global warming to 1.5 degrees will require “rapid and far-far-reaching” transitions in land, energy, industry, buildings transport and cities. It said global human-caused emissions of carbon dioxide need to fall by about 25 percent from 2010 levels by 2030, reaching ‘net zero’ around 2050 for temperature rises to be contained.